Since 2015, the world has been extremely aware of the migration occurring from Syria and African countries towards Libya, Italy and Greece. 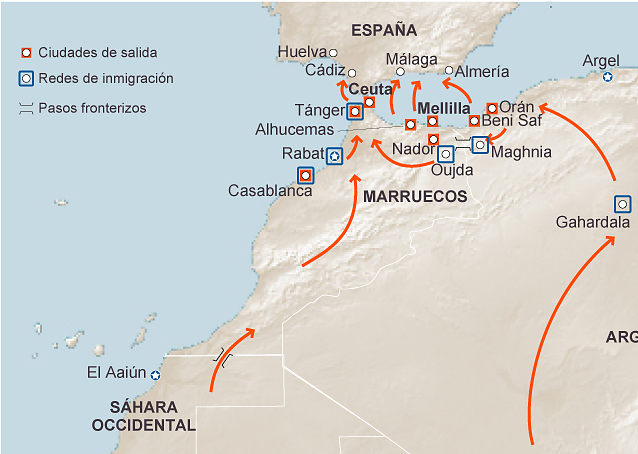 Another common route, rarely discussed in the international media, is the route that sub-Saharans are taking to enter Europe, the crossing from Morocco to Ceuta (18.5 km2) and Melilla (13.3 km2), two Spanish enclaves situated on the northern coast of Africa, sharing a border with Morocco and the Mediterranean Sea. These autonomous cities are the only European cities on Africa’s mainland. The motives for this migration are varied, as is the socio-economic status of the migrants. Some migrate because of conflict in their home country, others in search of education or even adventure that can play the role of an initiation. The majority of people who attempt to cross are young men (14-35 years old) from West Africa who arrive in Morocco with little or no money, because what money they had has often been stolen from them. Many of them leave families behind that are desperately waiting for money they hope to send home upon finding employment in Europe. The map below illustrates different routes by which people commonly arrive to Spain. The trip to reach Morocco is often strenuous and dangerous; sometimes it involves crossing the Sahara, which migrants call the second sea, and smugglers regularly take advantage of their customers. When migrants reach Morocco, they stay there for some time to earn money and wait for the right time to cross into Europe, often living in make shift shelters near the border for months or even years. Different modes of transportation are used to cross the border, including cars, planes, and boats, but the most affordable way to attempt the crossing is by climbing the fence that separates the Spanish enclaves from Morocco. The first fence between Morocco and Spain was erected in 1998. Additional reinforcement and fencing was added over the years. In 2014, 80.000 illegal immigrants gathered in Morocco to try to enter Europe through Spain (in comparison, more than 200.000 that went through the Mediterranean routes). For instance, between January and February of 2014, more than 4000 people tried to cross the fence and 600 made it. 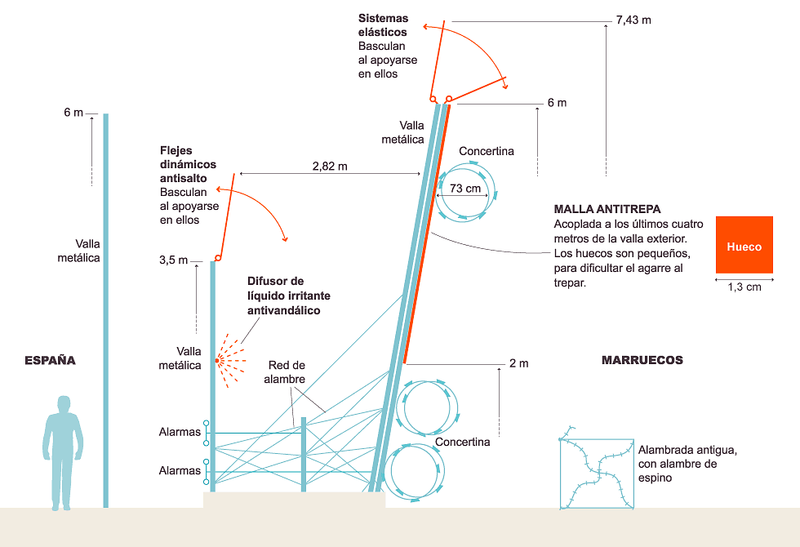 Since 2014 migration from Morocco across Spain’s southern border has increased drastically, even as the fences around Ceuta & Melilla have been reinforced yet again by increasing the layering of razor wire, as well as increasing the amount of cameras and guards. An extra fence has been added that does not provide handholds for climbing. These additions have made crossing the border more difficult but not impossible. For instance, migrants now climb the fences with with hooks attached to their hands and shoes. When aspiring immigrants fail to cross the fence, they are often beaten and have their papers taken away. Then they are sent hundreds of kilometers away, to Rabat, Fes or Casablanca. Soon they try again and fail, and try and fail, as if in an infinite loop that has no exit: They are trapped in Morocco, which they cannot leave towards Spain, and without papers they can’t go back to their home countries, either. They are trapped in the forest where each day, they hide and run from the police. They are trapped, as they appear to be inside the dome created for this installation. They are trapped, but still they have hope.